1 chicken stock pot, see page ?? Preheat the oven to 160ºC fan oven/180ºC/gas 6. 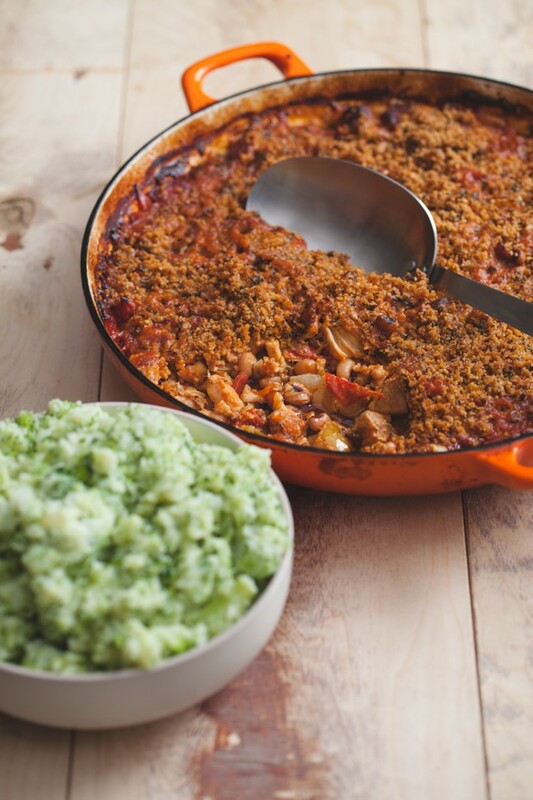 Heat the oil in a large hob to oven casserole dish and add the onion, celery and leek. Fry until the onions begin to soften. Add the chicken and pork and fry until the meat is no longer pink. Add the thyme leaves, tomatoes, water, stock pot and tomato purée. Bring to the boil and mix well. Season well with salt and pepper. Place in the oven, with a lid on, for 1 1/2 hours. Mix together the breadcrumbs, butter and basil. Take the casserole out of the oven, stir in the black-eyed beans and sprinkle the breadcrumb mix over the top. Return to the oven for 30 minutes. Meanwhile, peel the potatoes and cut into 2cm chunks. Add to a pan of boiling water. Cut the stalks off the broccoli and chop quite small. Add to the potatoes and simmer gently for 5 minutes. Add the rest of the broccoli and simmer for a further 5 minutes. Drain and return to the pan with a good chunk of butter. Mash and serve with the casserole.